Wireless analog cameras provide different concerns than do digital (or IP) cameras. One of the primary benefits of IP (Internet Protocol) cameras is the relative simplicity of transmitting their output wirelessly or across long distances in a wired environment. Analog cameras are not quite so fortunate. 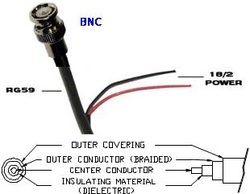 Analog cameras are wired via coaxial cable (pictured left) and are terminated with BNC connectors. Coax cable has limited transmission capabilities - in terms of distance. One solution to coaxial cable limitations is to transmit the video over CAT-5e or CAT-6 (Ethernet) cable. ...and video baluns (devices that switch video signals from one wiring scheme to another) work great! But that still doesn't migrate analog video through the air wirelessly. ...is a pair of devices (one on the camera end and one on the DVR end) that both require power (i.e. not entirely wireless) but actually do succeed in communicating the analog signal wirelessly. renders 2-3 of the available channels worthless. read) 250-300 feet - 25-50 feet through walls and/or ceilings. IP are (typically) a combination of analog and digital technology. Once the data has been digitized, wireless transmission (via any of the technology existing in the Information Systems world is possible. Since the digital data is in a format that is consistent with the much broader Information Technology Systems marketplace, devices (wired and wireless hardware) are readily available for network video transmission. Problems which the IP video industry have (for the most part) overcome have more to do with minimizing file size than they have to do with transmission hardware. The advent of Mega-Pixel IP cameras has "created" even larger file sizes and magnified the problems. One issue is to get the video from Point-A to Point-B. It's an entirely new concern when, while doing so, all the rest of a company's network traffic grinds to a snail's pace.